Extra safety and extra peace of mind. This bright, reflective safety vest makes you more visible to drivers when you’re biking, jogging, or walking the dog. Arrows on the front and back can be seen up to ¼ mile away and give a visual cue to give you space. A zip pocket keeps essentials secure when you’re out and about. Dimensions: 23.5" x 22" x 0.25"
ArroWhere’s reflective safety vest came to be when Maker Khyle Pinkman was inspired by a bike-riding family member. The cyclist, worried about how closely cars and trucks drove to him, sewed a reflective arrow (like a road sign) onto the back of his jacket. It did the trick of alerting drivers to give him more space and showed that people are more likely to react to something they recognize, like an arrow, faster. 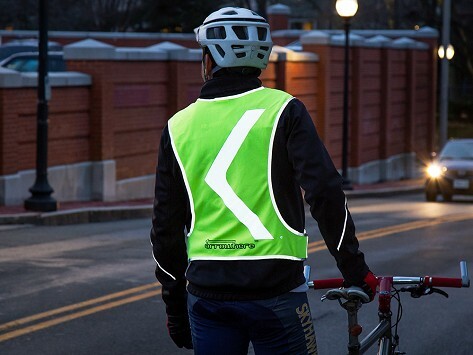 An ArroWhere vest features a reflective arrow on the front and back that gives drivers the visual cue to steer clear of cyclists, joggers, and dog walkers. And while it gives the wearer increased visibility (it's twice as bright as the typical safety standard), it also gives them increased peace of mind, too. A vest is an adjustable, easy add-on to your heading-out gear that lets you be seen up to ¼ mile away. That sounds like a good sign to us.